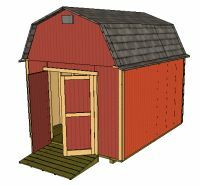 10' wide x 12' long x 11' 9" high Gambrel roof style shed plans. 2x4 construction with 12' on center treated floor joists. Loft construction for added storage. This gambrel shed will get you lots of storage.